Senator Michael Bennet (D., Colo.) blundered when trying to localize the impact of the ongoing government shutdown to his constituents in Colorado. "Today marks up to $24 MILLION in lost revenue due to closed national parks in Colorado," Bennet's tweet began. "@realDonaldTrump‘s shutdown is causing our state's outdoor economy to lose $1.9 million per day and withholding pay from more than 7,000 Coloradans. This is unacceptable." However, local TV news anchor Kyle Clark questioned Bennet and his office on the assumptions behind the math. "Bennet's office now acknowledges this shutdown impact figure is overestimated," Clark noted on Twitter. "They took total national park visitor spending annually and divided by 365 days. Colorado's natl. parks are packed in the summer/fall and often largely empty this time of year. #9NEWS #copolitics"
The conservative blog Colorado Peak Politics further pointed out that places such as Rocky Mountain National Park aren't technically closed at the moment. Some roads into the park have been gated shut because the roads have not been plowed since the shutdown. But visitors "can still bike, walk or snowshoe" into the park, according to a report by Colorado Public Radio. Bennet is yet another Democrat considering a run for president in 2020 in a field already overflowing with hopefuls. Recent polls, however, have shown Bennet and fellow Coloradan Governor John Hickenlooper in the single digits. Bennet has had other notable media gaffes. In 2010, he was caught on a hot microphone complaining to an unnamed colleague about the Democrats' plans for a lame duck session. "It's all rigged," Bennet said to the mystery colleague. "I mean, the whole conversation's rigged. The fact that we don't get a discussion before the break about what we're going to do in the lame duck—it's just rigged. This stuff's rigged." The Washington Post called it a moment of "extreme candor." 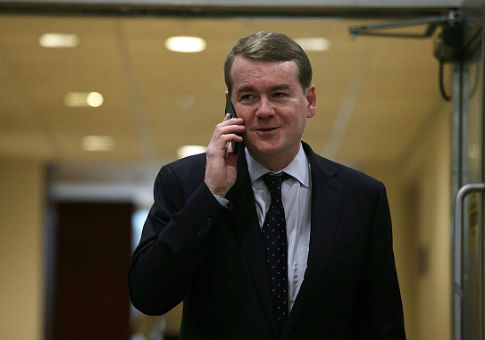 A few months earlier in 2010, Bennet was blitz-dialing Colorado radio stations on Election Day in a last-minute get-out-the-vote push, but wasn't remembering that not every host in Denver was happy to take the call. Radio host Peter Boyles said he had requested Bennet to come on the show numerous times over months, but the senator had never come on. So, why now? "I actually didn't know that ‘why now,' just to urge everybody to go to the polls and vote, it's a really important election […] I apologize I haven't been on, I've traveled this state, 30,000 miles." The interview with Boyles didn't last much longer, and was played up in conservative outlets such as National Review. This entry was posted in Issues and tagged 2020 Election, Michael Bennet. Bookmark the permalink.